Although there has been an increase in the incidence of esophageal and gastroesophageal junction (GEJ) adenocarcinoma, physicians have seen an improvement in overall survival (OS) over the last 40 years, due to strides made with VEGF inhibitors, TAS-102 (trifluridine/tipiracil; Lonsurf), and checkpoint inhibition. 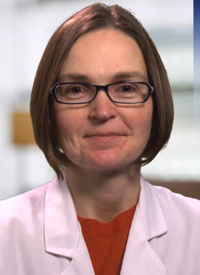 “It’s pretty exciting—after a long time of not much happening in gastric and esophageal cancer, we’re moving somewhere,” said Hope E. Uronis, MD, MHS, in a presentation during the 2019 OncLive® State of the Science Summit™ on Gastrointestinal Malignancies. During her lecture, Uronis shed light on these therapeutic classes and the trials that have demonstrated their utility and refined their applicability across settings, subpopulations, and histologies of gastric/GEJ cancer. Bevacizumab (Avastin) was the first VEGF inhibitor to be tested in combination with chemotherapy as frontline therapy in patients with advanced gastric cancer in the phase III AVAGAST trial. However, the combination of bevacizumab, fluoropyrimidine, and cisplatin failed to demonstrate a statistically significant benefit in OS over placebo, said Uronis. Ramucirumab (Cyramza) is perhaps the most commonly utilized VEGF inhibitor in gastric/GEJ cancer, explained Uronis. The agent operates as a fully human IgG1 antibody that binds to the extracellular domain of VEGF receptor 2, thereby blocking binding of VEGF-A, VEGF-C, and VEGF-D. The VEGF inhibitor was tested in combination with chemotherapy as frontline therapy in both the phase III RAINFALL1 and phase II RAINSTORM2 trials. Notably, the population was predominantly Western in the RAINFALL trial, said Uronis. However, regardless of the chemotherapy backbone, both trials were negative. In the United States, ramucirumab was also tested in combination with FOLFOX in a phase II trial in patients with metastatic esophageal, GEJ, and gastric adenocarcinoma, and again, resulted in negative findings, said Uronis. In terms of second-line VEGF inhibition, investigators compared the use of ramucirumab with placebo in the phase III REGARD trial.3 In the study, patients with metastatic gastric/GEJ adenocarcinoma were randomized to receive either ramucirumab or placebo. The trial enrolled a predominantly Western population. The trial met the study endpoint of OS, with a hazard ratio of 0.776. Ramucirumab resulted in a 5.2-month OS compared with 3.8 months in the placebo arm. Progression-free survival (PFS) and response rates were also superior with ramucirumab, ultimately leading to its FDA approval in 2014 for second-line use following prior exposure to a fluoropyrimidine or platinum, said Uronis. Ramucirumab was also paired with paclitaxel in the phase III RAINBOW trial.4 Patients with advanced gastric/GEJ cancer were randomized to receive either 80 mg/m2 of paclitaxel on days 1, 8, and 15 and ramucirumab once every 2 weeks, or paclitaxel and placebo. The median OS indicated a survival benefit of approximately 2 months with ramucirumab, said Uronis (HR, 0.807; 95% CI, 0.678-0.962; P =.0169). Approximately 70% of the population was Western, noted Uronis, cautioning against the study’s generalizability across all patients with gastric/GEJ cancer. In the refractory setting, patients with ≥2 prior lines of therapy and an ECOG performance status of 0 or 1 were randomized 2:1 to receive either 35 mg/m2 of twice daily TAS-102 on days 1 to 5 and 8 to 12 of every 28-day cycle or placebo in the phase III TAGS trial.5 Patients were stratified by prior gastrectomy, representing approximately 44% of patients in both arms, said Uronis. Patients were further stratified by ECOG performance status, region of the world, and prior exposure to ramucirumab. Gastric cancer represented the predominant primary site, at 71% in both arms, said Uronis. PFS served as a secondary endpoint of the trial, although no difference was reported between arms. Moreover, prior gastrectomy did not seem to impact the observed benefit in OS, added Uronis. Toxicities were consistent with expectations, although approximately one-fifth of patients experienced grade 3 anemia and neutropenia.